A British company has launched a new way of downloading games. Unlike other systems, Awomo allows people to start playing a game before all the software has been downloaded. The developers say that waiting times between clicking a download link and actual game-play have been slashed. "This is a super-fast way of distributing games. For the first time we have created a system that really does for games what iTunes does for music," said Awomo boss Roger Walkden. While the digital distribution of music is well established, video-game downloading still makes up only a small percentage of total sales. John Houlihan, who manages the Computer and Videogames website, told BBC News digital downloading represented the future for gamers. "File size [of games] still makes digital downloading prohibitive in many cases, but as fibre optic comes in, that will really change things," he said. Digital distribution of video games was pioneered by the developers of Half Life, Valve. Launched in 2003, Steam has grown into one of the leading portals for video-game downloads with nearly 600 games on offer and 20 million subscribers. However, with Steam - and other digital download services, such as Direct2Drive - the entire package needs to be downloaded before it can be played. With file sizes in the gigabyte range, downloading can take a significant amount of time, especially on broadband with limited bandwidth. 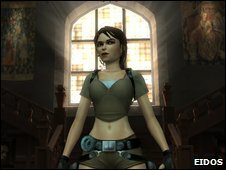 Users need less than 10% of Tomb Raider Legend before they can play. 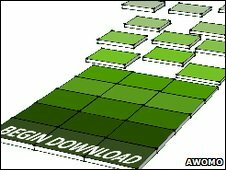 "What Awomo does is take the core files used to play the game, which is enough to get you up and running, and then download the rest of the content in the background," said Mr Walkden. One of the games on offer is Tomb Raider Legend. While the game weighs in at 7.2GB on a typical internet connection, users will only need to download 652MB before they can start playing. Although the other files are needed, they are not required in the initial stages and can be downloaded in the background. Not every game can work this way and the developers acknowledge it can take some time to work out if a game is suitable for partial download and play. John Houlihan said people's attitudes to digital downloading also needed to change. "There's a degree of nostalgia to physically buying a game from a shop. "Like vinyl records, people like having a DVD, box and associated manuals, but that will also change over time," he said. "We're on the cusp of a digitally downloaded gaming future."